THE PAINTED LADY is a true beach house type property and is only a 3 minute walk to the beach! This Key West/Cape Cod style 2 story home in Daytona Beach features an inground heated pool. Centrally located! Only a short 7 block walk to the Ocean Walk/Bandshell/Ocean Convention Center area.. THE PAINTED LADY features 4 Bedrooms, 2 Baths, In Ground Heated Pool, Flat screen TV's, WIFI, Netflix and Charcoal Grill. It's a 10 min. drive to Daytona Speedway and Daytona International Airport. It's a 5 minute ride to Main St. and only a 3 minute walk around the corner to the most famous beach in the world. Quiet, historical neighborhood. Tropically landscaped back yard. UPSTAIRS there are 3 beds (1 king, 1 queen and 1 full), 1 shower bath. DOWNSTAIRS: There is one King size bed in the Master BR with shower bath . You'll appreciate the fully stocked (everything you'll need to cook with) kitchen with dining area. There's also a formal dining room, living room and a family room that faces the pool and back yard. The family room has a large, flat screen TV and Netflix. The quoted rate is good for up to eight persons. Close to all Bikeweek, Biketoberfest, Turkey Run and Daytona 500 activities---yet quiet, good neighborhood. Must be at least 30 years old to book. City Code Restrictions: No trailers, campers or 5th wheel size trucks, parking in the grass next to the street and no more than three vehicles in the driveway at any time. House Restrictions: No extra visitors or noise outside after 10 p.m.
Due to city wide noise ordinance, NO NOISE outside after 10 p.m. I'm a retired high school teacher. I have 3 adult children, 2 grandchildren and 1 great grandaughter. I'm a southeastern Kentucky, Letcher County girl, raised in Indiana, a Master's graduate of Indiana University and was born to wonderful, hardworking parents. I buy and restore old beach houses for a living. I enjoy painting palm tree murals for people and doing decorating and 'staging'. I love to travel on my Harley Streetglide and meet new people. I bought the 'Painted Lady' property as a 'flip' property in 2005 and restored it. I liked it so much I kept it. I'm very proud of it and hope you'll enjoy your stay in it. Come to sunny Florida---the beach is waiting for you! I bought this house because of its close proximity to the beach and its pretty pool. The house was strong and had lots of character. I've added lots of lush landscaping and I won the landscaping award in Oct. 2009 in this district. It was an easy house to make beautiful! The local newspaper wrote an article about The Painted Lady in 2015. I know you will enjoy this home! Walk only 1 block to the world's most famous beach! Walk to several good restaurants. There are many wonderful golf courses in Daytona. Sheets, pillow cases, blankets, pillows, quilts. Parking for up to three vehicles ONLY in the driveway. No large trucks, trailers or RVs. Formal living room with queen sleeper sofa and also a loveseat sofa. Blender, baking pans, large pots, waffle maker, hot water maker, etc. Spices are furnished as well as refrigerated condiments. The kitchen is fully stocked with dishes, pots, pans, utensils, aprons, silverware, spices, condiments, serving bowls, table cloths, dish cloths, drying towels. Cable Tv in family room and most bedrooms. Bose radio for indoors as well as a small radio that can be taken outdoors. Adults books and children books. There are many movies provided. Tennis court 1 block away. 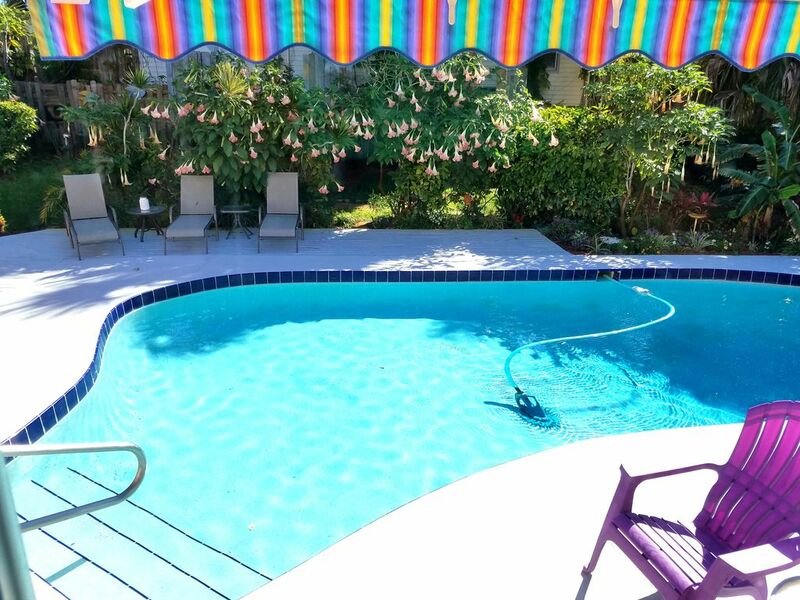 Beautiful inground heated pool with shallow and deep ends. Great area for relaxing. Smoking allowed outside only. Smoking inside not permitted. Enough parking for 3 cars in driveway Owner available for your needs. No pets. Beautiful house. Loved our time their. Highly recommend this home. This house is simply fantastic. The location is wonderful, being both close to the beach and close to fun attractions (we loved the 30 minute tour of the Speedway and the Ponce Lighthouse!). The pool is wonderful and relaxing. The kitchen is well stocked (no need to bring your own spices!). The bedrooms are comfortable and relaxing. Definitely recommend this house and any other house that Sandy hosts! She is the best!!! Sandy's home is amazing! As comfortable as home. Close to the beach and a lot of action of downtown life if that is what you like, as well as far enough away from being too busy. We walked to the beach almost everyday and an easy walk to restaurants. Pool was perfect for all ages. Great sun deck for the morning and afternoon sun and perfect shade for a break from the powerful Florida sun come late afternoon evening. We played football in the front yard with the kids on perfectly manicured lawn. Sandy was wonderful. She showed us where and how to get around and let us enjoy our stay without any bother, but she was such great company to us and our kids we would ask her to join us a few times. Definitely stay again. Home so nice would like to be our own! I enjoyed the Kuhl family so much. Beautiful family. I hope they come back soon! Perfect guests! This is an Amazing 80-year-old home! A smoker friendly property, unheard of these days, in a quiet neighborhood, great for relaxing by the heated pool. Sandy is a wonderful hostess and has provided just about everything you could possibly need while on vacation. A fully stocked kitchen, plenty of bath/beach towels, extra blanket/pillows and a hair dryer in each bathroom. The only thing missing was a washer and dryer for guests to use. This property is priced right and would be recommend to anyone looking to stay near Daytona Beach for a week or two. I'm happiest when my guests are comfortable, relaxed and enjoying their stay. Guests that require a few things laundered are always encouraged to use the clean and friendly laundromat a short 5 minute drive away. They wash, dry and fold your clothes. Enjoy! This vacation rental was the perfect stay to finish our family vacation of a life-time. After 2 weeks staying at Disney for the last week of our vacation we stayed in this rental. The property was lovely presented and very clean. My daugther loved the pool and having multiple choices of beds to sleep in. Property is a short walk to the beach and a little further walk to the pier and where a lot of the entertainment in the evening was. This was very helpful to us Brits who drive on the "Left" but right side of the road normally! We were lucky enough to meet Sandy, the owner of the property, who was both very friendly and helpful. If we were to come back to Daytona in the future we wouldn't hesitate in staying here again. Highly recommended. Makes me very happy to know my guests have enjoyed their stay at the Painted Lady property as well as the things to do nearby. I love, love coming to this house! It is only a block from the beach! Close to entertainment and lots of restaurants! I love how peaceful it is around the house. The house is clean beautifully decorated and very comfortable. The beds are always clean and very comfortable to sleep in! I believe they do have pillow top mattresses! It's always fun to lay by the pool and take a day of relaxation! It's always clean, beautifully decorated in the back of the house also. There's picnic table barbecue and a hot tub and of course the pool which is heated !! I can't wait to go back and spend more time there! This one of is my very favorite places to go relax and have fun! The Painted Lady is a true beach house decorated and tropically landscaped with 4 BR, 2 Baths, 2 story situated 2 residential blocks from the world's most famous beach. Yes, you can still drive on the beach here in Daytona! In this area, however, there's not much traffic on the beach near where the Painted Lady property is located. Hidden back yard gives guests a covered outdoor dining area and heated pool. Inside accommodations are 4 beds (2 king, 1 queen, and 1 full), 2 shower baths, a fully appointed kitchen with dining area, a formal dining room for 8, a formal living room and a family room that looks out onto the pool and back yard. Each bedroom has a TV with remote as well as in the family room. Close to all Bikeweek/Biketoberfest/Turkey Rod Run, Daytona 500 venues----yet quiet! Good, beachside, residential neighborhood! Person renting must be present and age 25 or older. This property does NOT host weddings, receptions or large reunions due to parking restrictions. Must be 30 yrs.of age to rent. Prices quoted are good for up to 8 persons staying. Each extra person is an additional $300. per entire stay. No indoor smoking. No pets. No weddings, receptions, large reunions, or events due to parking restrictions. Please check the Daytona Beach website for a calendar of events and dates of each. No large fifth wheel trucks or trailers due to code enforcement. 3 vehicle space in driveway only.